I am quite sceptical about online transactions and that’s why I always place my orders with a pinch of salt when purchasing a Uninterruptible Power Supply (UPS). Throughout my interaction with UPS devices, I have come across several crème de la crèmes and a plethora of so-so devices. In this review, I will knock off the cheap ones and only focus on those UPS devices which exhibit a stellar performance. I will also give you some tips on how to identify the flops and avoid them like a plague. A sudden power goes out will lead to data loss, hardware damage and shorten the equipment life expectancy. It’s why UPS comes in handy. It allows for safe closure of open files and proper shut down of electronics when an outage occurs. Furthermore, it safeguards electronics from commonly occurring power surges caused by storms, activity on the power grid, or high-powered equipment turning on and off. Some UPS comes with Automatic Voltage Regulation (AVR) as it can correct minor power fluctuations without switching to battery power, which extends battery life. AVR is essential in areas where power fluctuations occur frequently. It also helps stabilize incoming voltage, increase or reduce the voltage to a safe operating range. The price: You remember the old adage “Cheap is expensive”? Well, you might have to dig deeper into your pockets if you want to have top quality. This is a 600VA/330W battery backed UPS from APC. With this kind of power capacity, this is a really great device for your daily power requirements. 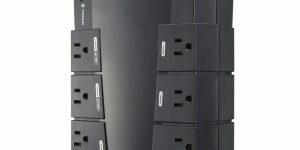 With seven total outlets, it features five outlets for providing surge protection and battery backup with the other two outlets being specially designed to offer protection against power surge only. The single 1.5A USB port strategically positioned at the top of this unit provides convenient charging for your Smartphone even when there’s power outage. 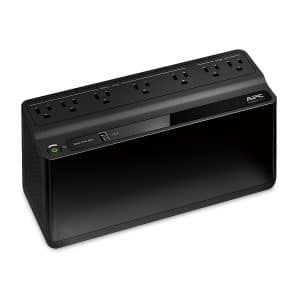 This UPS device operates in the sense that; when the power goes out, the APC battery backup is fitted with surge provides juice to ensure that your computer and other electronics including the router are fully functional. This means that you will still access the internet even when there’s an outage. – It can also supply power for external hard-drives. – Offers adequate surge protection. – Guarantees continuous power supply. During the stormy season which is often characterized by frequent power surges, this UPS is enough to work the magic for you. The CyberPower UPS features a 685VA/390W interactive UPS system which keeps it on a tip top performance. The automated power regulation ensures that overvoltage’s and brownouts are automatically corrected and rectified without you having to switch to battery. This way, you keep on using your computer or laptop without distractions. What’s more, it boasts a GreenPower Bypass Technology with a stellar rating on quality and performance. If you want to keep your computer fully functional even when you have juice failure, then I recommend this UPS. Additionally, it features eight outlets with four of them being for battery or surge and the other four being specially designed for surges only. 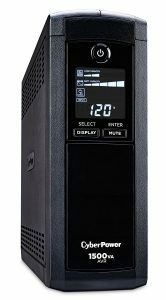 Something else; this UPS comes with Ethernet, a coaxial data line and telephone surge protection to ensure that access to communication and the internet isn’t interrupted by storm or power failure. – Offers hours of uninterrupted power supply. – Makes use of healthy GreenPower technology. – Comes with a USB and Serial management software. – Sometimes takes longer to respond to power outages. 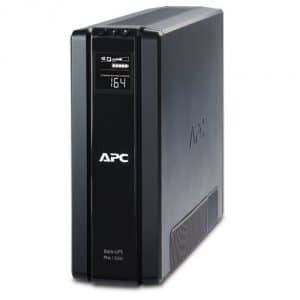 Featuring a 1500VA/865W rating, this APC UPS ensures that you have enough power to keep your computer and other electronics running even after experiencing a power outage. 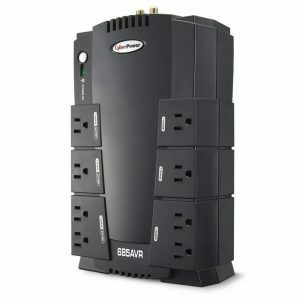 It boasts ten total outlets with five of them being specially designed for backup and surge protection while the other five only offer surge protection. The automatic voltage regulator keeps the voltage in the right levels by either stepping it up or down without using the backup battery power. Furthermore, it comes with an external battery pack to offer added runtime for better results. – Provides surge protection for your devices. – Comes in a perfect size. Tripp Lite is a market-leader in the manufacture of top-level UPS devices. 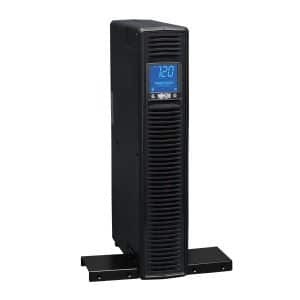 This particular UPS works in a whisper-silence and requires a minimal installation procedure. It boasts a 1500VA 900W and 120V power line for uninterrupted supply. The battery backup and unique power protection which is fitted with an LCD display and AVR make this UPS even better. It automatically corrects undervoltages from as low as 75V all the way to the required level. It can also correct overvoltages from as high as 147V without even exhausting the battery backup power. Furthermore, this UPS comes with a USB port, a 6 feet cord fitted with NEMA inputting plug and a DB9 serial, all of which are battery backed. The USB port allows for data-saving in case of unattended power shut down when you aren’t around to save the data you had been working on. Backed by a three-year limited warranty, this is a must-have UPS for the money. – It comes with $250,000-lifetime insurance. – It’s highly reliable during power surges. – It steps voltages up and down. Just like its earlier sibling, this is another incredible UPS available on the market. The CyberPower boasts a 1500VA/900W system which can protect your PCs, home entertainment systems and workstations against power surges. It also offers data protection and protects your electronics against catastrophic power problems. The line interactive system corrects overvoltages and brownouts without depleting the backup battery power. Additionally, this device incorporates GreenPower technology and reduces energy consumption for up to 75%. – Introduces an updated design. – It has additional outlets. – Comes with an easily readable LCD control panel. – Is backed by a three-year warranty. When looking for a UPS, don’t gamble with your money! Given the countless options available on the market, chances of buying a dud are very high. For that reason, don’t think twice; just add one of these great UPS devices to your cart!